Tired of pro-gun extremists perverting the meaning of our Constitution? Proudly wear this limited edition, U.S.-made, 100% cotton t-shirt (female cut available in drop-down). Part of the proceeds will go to CSGV to benefit our work to prevent gun violence. 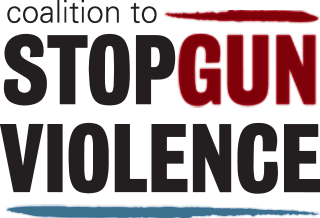 The Coalition to Stop Gun Violence (CSGV) seeks to secure freedom from gun violence through research, strategic engagement and effective policy advocacy. The Coalition is comprised of 47 national organizations working to reduce gun violence, including religious groups, child welfare advocates, public health professionals, and social justice organizations. There is an epidemic of gun violence in America. In 2011, there were a total of 32,351 gun deaths in the U.S. The firearm death rate among U.S. children 14 years of age and younger is nearly 12 times higher than the combined rate in 25 other industrialized nations. This is unacceptable and preventable. In order to pass life-saving gun reforms at the federal and state level, we must break the stranglehold that the National Rifle Association has over our legislatures. That means making them politically toxic. Support our work by purchasing your limited edition tee today! Part of the proceeds will support our "Guns, Democracy and Freedom" project. This innovative project talks about the issue of gun violence in terms of democratic values, and uses the term “insurrectionism” to describe the NRA’s treasonous interpretation of the Second Amendment. By turning the NRA’s “freedom” message against them, we are reframing the debate and putting the gun lobby on the defensive.